There are a lot of medical coding schools out there, but none offer medical coding courses like AAPC does. Designed specifically by healthcare professionals and instructors, AAPC’s medical coding classes are offered around the country. Students of these classroom courses learn the fundamentals of medical coding and dissect real-world medical cases and charts to extract the most relevant information. All classes are taught by AAPC-approved instructors who have been trained in our exclusive Medical Coding Training curriculum (MCT). 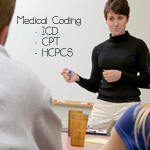 These medical coding courses are written and updated by the same people who write the AAPC certification exams. Graduates of AAPC’s medical coding courses prove highly successful in passing AAPC certification exams. Looking for Exhibiting Opportunities or Group Discounts? Call 877-290-0440 or have a career counselor call you. We want your feedback on AAPC! Take our 2019 All-member Survey and enter to win a $100 Amazon gift card. Which books are right for you? Call 877-524-5027 to speak to a representative.